Forecasts for a monster run of spring chinook salmon into the Columbia River system already have attracted a crowd. Downstream from Bonneville Dam, 63,400 angler trips were recorded through April 4, the highest since 65,800 were tallied in 2003. 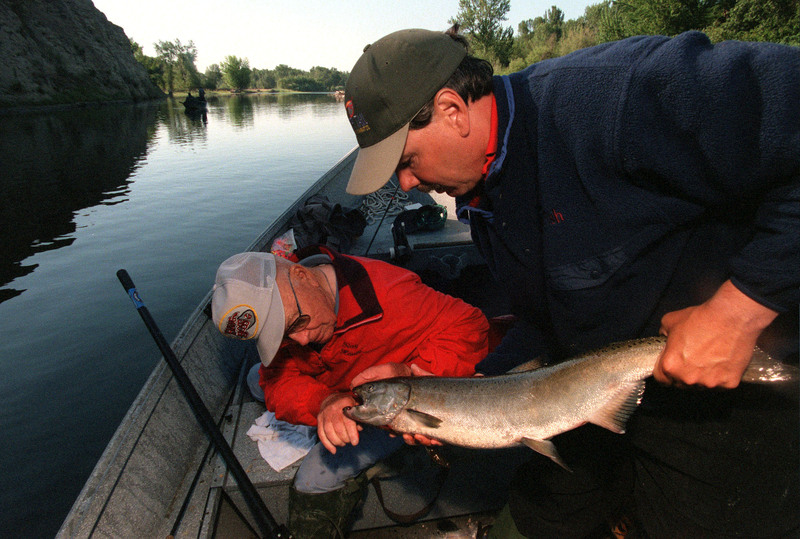 The 6,800 fish kept in March was the highest number since 9,000 were put on ice in 1990. Fishing success spiked to exceptional on April 6, with a rate of one fish per rod as more fish moved into the river and began their upstream migration. Spring chinook salmon have started their run up the Columbia and Snake river systems in what could be the biggest numbers since 1938. Or maybe not quite that big. Fishery managers in Washington, Idaho and Oregon are cautious because forecasting models have been skewed in recent years. But for now, they’re still predicting about 470,000 spring chinook will move up the Columbia – and the lion’s share is bound for Idaho. There’s more good news: Fishing conditions are likely to be good when the springers arrive upstream. Snowpacks in the Clearwater and Salmon river basins are well below average and that could spell better than average spring fishing conditions. Yakima River anglers expect the same advantage. The forecast is for 225,000 chinook heading to the Snake River and tributaries. But the run, as currently forecast, will be lopsided. About 140,000 chinook are expected to be headed for the Salmon River and Hells Canyon and 70,000 of those could be bound for the Rapid River Hatchery near Riggins. About 15,000 chinook are projected to return to the Clearwater River. That’s a big difference from the last big springer run to Idaho in 2001, when anglers harvested more than 20,000 chinook in the Clearwater. For perspective, the 2010 return of chinook to the Clearwater River is expected to be about three times what it was last year. But it will pale in comparison to the number of fish returning to the Lower Salmon River and to Hells Canyon. Idaho’s first chinook salmon fishing seasons of the year will open April 24 in the Clearwater River, Snake River, Little Salmon and the lower Salmon. While Columbia River fishing is underway, Washington has proposed opening Snake River spring chinook fisheries as early as April 20 below Ice Harbor Dam and April 24 in the Clarkston area. However, the proposals had not yet been approved as this publication went to press.